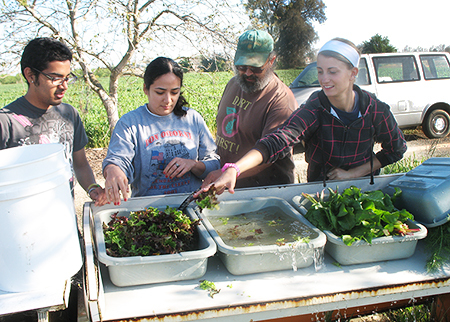 Anthropology students in Richard Wallace’s Field Work Process class work with a community-supported farmer at Contented Acres Produce in Gustine. Preparing tax returns for low-income families. Distributing food boxes to the hungry. Assisting organic farmers. Working with local governments to design safe bike routes. Mentoring at-risk youth. Sharing the wonders of science in elementary schools. Bringing art to underserved communities. The CSU Stanislaus community does all this and so much more. Service learning is part of the University’s DNA. It extends the classroom into the community and engages students in an education that teaches real-life skills. Students, faculty and staff are on the front lines working hand in hand with local nonprofits and city governments to improve the quality of life in the Central Valley. The Carnegie Foundation has recognized this dedication by honoring CSU Stanislaus as a recipient of the 2015 Community Engagement Classification, a distinction shared by less than 15 percent of four-year colleges and universities in the United States. The recognition comes less than a month after CSU Stanislaus earned a place on the 2014 President’s Higher Education Community Service Honor Roll, the highest federal distinction for a university’s commitment to service learning and civic engagement. Julie Fox, director of the Office of Student Learning, said the Carnegie Foundation recognition was bestowed only after a thorough assessment of the University’s academics, culture and commitment to civic engagement. All four colleges and nearly 60 percent of academic departments offer service learning opportunities, where classroom instruction combines with field work to create a powerful educational experience. Jennifer Helzer, the service learning faculty liaison, applies service learning in many of her geography classes to show the practical application of theory. Her students have trained local teachers in geographic information systems technology, assisted the city of Turlock with research for planning issues, and helped the Modesto Art Museum identify urban design districts. In 2013, students logged 120,015 service hours, more than double the amount just five years earlier. President Joseph F. Sheley has strongly supported community engagement practically from the day he set foot on campus in June 2012. The recognition will remain in effect for 10 years, but Fox said the University is not content to rest on its laurels.